Level of customization in the Android OS is undoubtedly mind-blowing and witness that you are living in the age of cutting edge technology. You might have wished you could have all the superb apps which you need on the lock screen of your Android device. And Googlers know you well and they created an app which rocketed in the market and attracted hundreds of thousands of users across the globe along-with a super successful tech-company Twitter (we’ll talk about it later). Former Googlers (Todd, Edward, Gordon and the team) founded the Cover Lock Screen in the last year and launched in around October 2013. 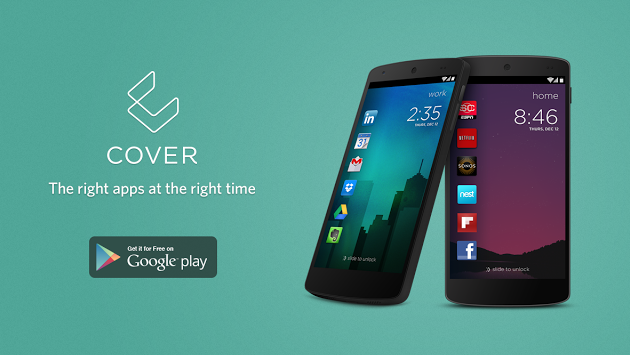 The Cover is a lock screen Android app which replaces your default lock-screen and shows six apps of your choice on the right time. But how Cover recognizes which app you might like to use? Of course, it analyzes your usage-behavior. It recognizes the places you go; business, home, car, or out. It means that the Cover is the smart app for smart-phone with smart OS (Android) which learns which apps you use and where. Doesn’t it seem like a ‘living intelligent app’ you would want to have onto your lock-screen? Curious how does it happen? You simply get into your car and pair it with your lock screen app with GPS, dialer and music at the ready. You go to the office and you find your emails, calendar or probably Skype. And this is what they call as, “Right Apps, Right Time”. You only need to build up the separate profiles for separate places and switch them over whenever needed. Building up the profiles with Cover Lock Screen app properly will allow you to enjoy more user-friendly experience to your wallpapers and ringtones as well. You’d not like to use the Cover Lock Screen just for two reasons; battery-timing and privacy concerns. Once you make your Cover work onto your Android smart device, it uses your batter well which means if you are a power-saver, you’d probably not use it. And privacy advocates may frown on the app because it collects your day-to-day data and your app habits, that’s another topic for them that the Cover CEO Mr. Todd Jackson stated that all the data is encrypted. Also, you can use PIN codes or patterns so that you might not give out your email address. But providing your email address is highly recommended because it customizes your phone highly. ‘Twitter – Cover Acquisition’ is one of very interesting acquisitions in the world of the Tech. Twitter, an online short message service, has acquired Cover, an Android lock screen app on April 7, 2014 without disclosing the terms of deal, immediately. According to Nicolas Lee at Mashable, apparently, there seems no reason for Twitter to acquire the Cover Lock Screen much like Facebook’s Oculus buy. May be, it’s because Twitter wanted to compete Facebook’s Home app. Yahoo also acquired Aviate for $80 million. It means that user customization of apps is highly important in the upcoming days. Every company is eyeing up to Android home screens. And Twitter didn’t forget that it was first created as a movile-first service as it generates more revenues in advertising from mobile than it does on the desktops.